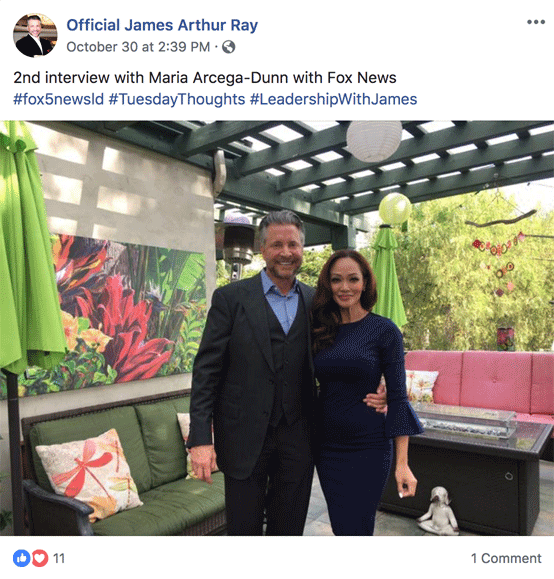 It appears that James Arthur Ray has a new book coming out, and I say "appears" because I can find no record of it anywhere but on his website. Yet Ray has already kicked promotion of this book into gear, pitching The Business of Redemption on his local FOX, CBS, and ABC affiliates. As a former book publicist, I find this whole thing very odd. Normally, media appearances would not be scheduled until the pub date, when finished books are in stores and available for purchase. This book doesn't even have a pub date, only vague allusions to "next year." I looked at Amazon and Barnes & Noble and found no listings or pre-order options for this book. That is something that is generally set up well in advance by publishers. But that's the other piece of information that seems to be missing. There is no mention of a publisher. My back-of-the-envelope calculation tells me that this is a self-published book and a poorly coordinated one at that. I am speculating somewhat, but unless I miss my guess, Ray is counting on pre-orders through his website to fund the production of finished books, hence the vague pub date, which is probably contingent on how many orders come in and when. This leads us to the most disturbing aspect of this venture. Why start promotion of this project in October, the very month that three people died on his watch? Not for the first time, Ray's attachment to this tragedy seems more ghoulish than respectful, let alone repentant. I mean... what did that press release look like?! Did he send it out on October 8th? I would not put it past him. Not for the first time, Ray is treating the deaths of Kirby Brown, James Shore, and Liz Neuman like so many lemons from which to make lemonade. But it's not just exploitive. It's creepy, as if he's trying to squeeze some sort of magical power from what he has more than once described as their "sacrifice." He has even promoted himself as heroically rising like a phoenix, from the flames of their funeral pyre. How did he mark the ninth anniversary of the sweat lodge tragedy? 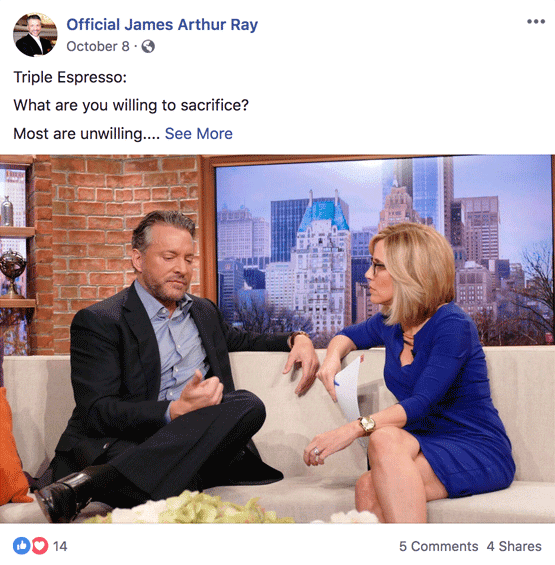 He posted a diatribe on the necessity of "sacrifice." More strangely still, he's included a two year old photo of himself being interviewed by Alisyn Camerota. This interview did not go terribly well for him. In fact, he was challenged directly by her co-anchor John Berman on his bizarre implication of their "sacrifice." You're saying they -- they died in the sweat lodge at your retreat and you're saying that was an act of sacrifice for them? That they gave everything they had? All of this reads like a dog whistle, but for God's sake, what is he whistling and to whom?! Over and over he refers to the lives of people who died on his watch as "sacrifices" for some kind of gain. But who gains? They're dead. They've gained nothing, nor have their families and friends. The implication seems to be that it is he who has something to gain from their deaths, when as a matter of law, he killed them. 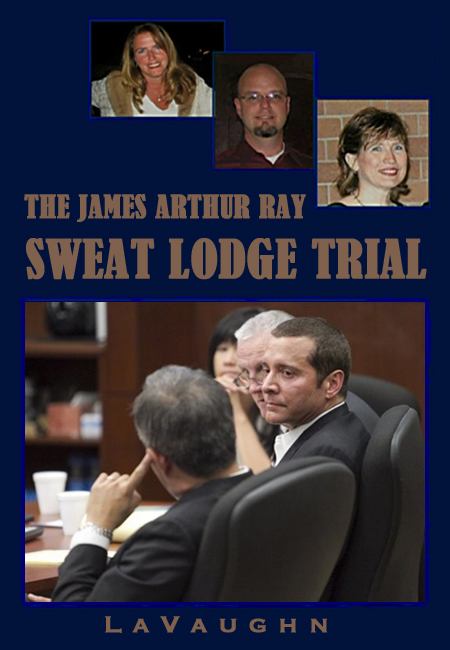 I first became concerned about the suggestion that this tragedy was some kind of dark ritual during the sentencing hearing of the sweat lodge trial, when prosecutor Sheila Polk read from one of the letters of support from Ray's followers, which also cryptically alluded to their "sacrifice." James has integrity and his message has integrity. I am witnessing the power of his spoken word. I am witnessing the shadow side of Harmonic Wealth. The 2009 Spiritual Warrior Retreat is a great lesson. The LESSON has touched the consciousness of the world. I respect and honor the sacrifice of Liz, Kirby, and James. I request compassion for my friend James Ray. Did she see the deaths of three people as some cosmic sacrifice for "wealth?" If so, is this a wild overstatement of what Ray was teaching or just following his teachings to their natural conclusion? Shudder. That he would again reference this disturbing idea on the ninth anniversary of their deaths only heightens this concern. But here he is, merchandizing deaths he caused as his own story of triumph over circumstance. Of the three interviews only Channel 10 did their due diligence by interviewing a vocal critic of Ray's, Connie Joy (seen above). On CBS he was spinning like a top and using words like "leverage" to cringeworthy effect. It's worth watching, if only for the chilling reveals, like his duping delight (4:06), when he claims to have found "compassion." Or when he wrongly defines "empathy" as "attempting to feel like you feel." Spoken like a man with no capacity for empathy. Ray turns again and again to half-remembered dictionary definitions of words, in lieu of expressing actual emotion or contrition. 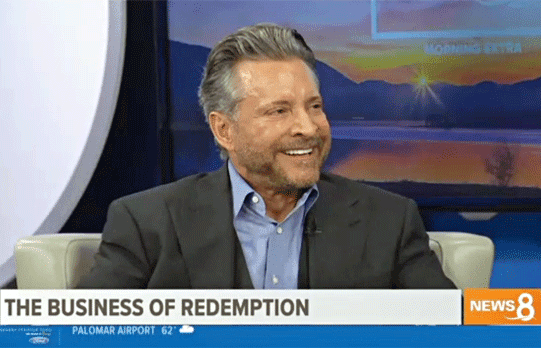 In explaining the title of his book, he says, "Well, I am seeking redemption and if you look at the definition of that it's to gain or regain something by paying the price." Note that he does not include the Christian meaning of the word, salvation from sin or evil. For Ray, redemption is a business transaction that neatly avoids atonement, hence the book title. The most embarrassing was this softball interview with a fawning reporter from FOX, with whom Ray seems all too cozy. The network posted very little of the interview to their website, but it can be heard in full on his Facebook page. “It was my lodge. It was my event. It was my choice to do a dangerous activity, and so therefore, as a leader -- which the new book “The Business of Redemption” is all about leadership -- as a leader when something goes wrong in your entrepreneurial business or in your large corporation, there’s one person who is in the cross hairs [sic] and one person who is responsible," said Ray. But Ray has never taken responsibility. He has tried to evade it at every turn, like when he proclaimed and deflected responsibility in the same breath, in the flaccid documentary Enlighten Us. Ray spent himself into abject poverty on lawyers and legal fees in a long, drawn-out trial, when it would have been cheaper and far less self-destructive to plead out and pay restitution to the families. And even after destroying himself and causing more pain to everyone involved, he attempted to have his conviction set aside. He failed, but here he was, minutes later, refusing to admit to the "homicide" part of the "negligent homicide" charge for which he remains convicted. These are not the actions of a man who has accepted responsibility. They look more like the actions of a man who thinks he can turn a profit on the bodies of his victims. Used the word sacrifice??? How about 'victim' for your ego and stupidity. Also, a book about redemption?!? Redemption is an act, a willful decision. Not a book. You walk redemption you talk redemption and maybe a book about forgiveness would have served better. Shame on him. I find the whole industry sham.